Special Containment Procedures: Containment of SCP-1912-J is to fail at every possible opportunity. The cost and ridiculousness of keeping an object as large as SCP-1912-J hidden from the general population is too great a burden on the Foundation’s resources. Methods of failing SCP-1912-J's containment may include, but are not limited to: education campaigns, economic development, tourism advertisements and complaining on social media. 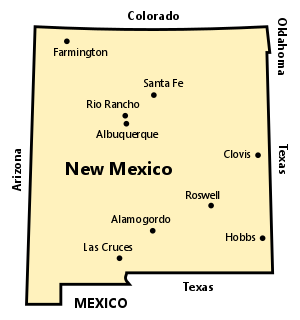 Description: SCP-1912-J is the entire state of New Mexico in the United States. SCP-1912-J measures 550km by 595km, with a total area of 315,000 km2, located between latitudes 31° 20’ to 37° N and longitudes 103° to 109° 3’ W. SCP-1912-J also contains over 2,085,000 instances of SCP-1912-J-1, which are capable of rapid self-replication, and communicate through such methods as Navajo, Spanish and English. Incarceration of SCP-1912-J-1 instances as non-American nationals. Expectation that SCP-1912-J-1 instances produce passports on domestic travel. Mislabeling of SCP-1912-J on maps as “Mexico” or “Arizona” by respected institutions, such as The New York Times and its magazine. Surprise that SCP-1912-J-1 instances exhibit a high degree of English fluency. This effect does not appear to extend to non-human organisms, who have no awareness of SCP-1912-J's presence, nor of most political boundaries in the first place. SCP-1912-J's development dates to the Treaty of Guadalupe Hidalgo in 1848 after an anomalous tectonic land-shift saw the region transfer between Mexico and the United States. The creation of SCP-1912-J occurred on January 6, 1912 when 490 old white-men in Washington, D.C., over 3000 km away, chanted and brought the object into being. Whether these men have any connection to The Church of the Broken God is still under investigation. SCP-1912-J-1 instances have also been observed vaguely following the directions of a “Governor,” now classified as SCP-1912-J-2, who makes containment failure less attractive. Addendum 1912-J-A: Due to the continued containment success of SCP-1912-J against the Foundation’s best efforts, the use of SCP-1912-J as a thaumiel-class object is currently under consideration by the O5 Council. Procedures: A gaggle of 5 teenage males are told about the existence of SCP-1912-J. Results: Subjects forget the existence of SCP-1912-J within 3.5 minutes. Procedures: A gaggle of 5 teenage females are told about the existence of SCP-1912-J. Results: Subjects forget the existence of SCP-1912-J within 4 minutes. Procedures: A gaggle of 5 D-class personnel are told about the existence of SCP-1912-J. Results: 4 subjects forget the existence of SCP-1912-J within 8 minutes, but D-95782 laments having committed murder selling methamphetamines there. D-95782 is subsequently terminated for being less interesting than the television series. Procedures: An expert in American history is told about the existence of SCP-1912-J. Results: Subject acknowledges SCP-1912-J's existence, but cannot find its location on a map. Procedures: An instance of SCP-1912-J-1 is told about the existence of SCP-1912-J. Results: Subject stares blankly at Foundation personnel. Procedures: Multiple SCP-1092 instances are released into SCP-1912-J. Results: All SCP-1092 instances accidentally neutralized due to lack of water for survival. Procedures: SCP-682 is released into SCP-1912-J. Results: SCP-682 disappears from Foundation personnel after 3 days, presumed contained. SCP-1912-J-1 instances noticeably more agitated. SCP-1912-J-2 was not available for comment. Procedures: Dr. Bright is released into SCP-1912-J. Results: Within 3 hours, Dr. Bright had been made “Governor” of the SCP-1912-J-1 instances, who cited his superior responsibility to the current SCP-1912-J-2.